Deary me: a TBR like this and I appear only to have read six books this month. I’m not sure how that has happened, although, in my defence, one of those read is Dance to the Music of Time: Summer, which is three books in one, and I am on the third of three books in the Autumn volume, too. So really that’s another five, right …? Anyway, I deviated slightly from my lovely Bello books and big non-fiction volumes on a couple of bus journeys and a gym trip to read the lovely Michael Holroyd which I bought on our holiday in March. I am feeling slightly panicky about the reading I’ve achieved, and now Strictly Come Dancing has started up again, with its attendant daily programme on the telly, I’m going to have to be rigorous about carving out reading time. On the plus side, I haven’t acquired too many new books this month (in fact, none apart from a couple of cat behaviour ones, and I might have ordered one for work but that won’t arrive until next month …). A multiple biography of Alice Keppel, Eve Fairfax, Violet Trefusis and a host of other women connected in some way to Lord Grimthorpe and his Italian villa. We visit the places they live and dip into their records and correspondence, and Holroyd himself and the process of writing biography is woven through the text as he explores his subjects’ histories and encounters other researchers of the families on which he’s working, and travels to the villa in Italy himself. This makes for a warm and intimate atmosphere, suitable perhaps for a book full of affairs, love and hidden intimacies themselves. Holroyd works hard to keep us reminded about who everyone is, and provides family trees. There are some photographs but maybe not enough (although maybe they don’t exist). It was nice to find our old friend Vita Sackville-West (and her grandson, Adam Nicolson) and I’m reminded to re-read the Violet-Vita letters. A smallish volume and I think Holroyd’s last work of biography, which is a shame as he’s pretty well my favourite biographer. We’re on to the second Movement, or Season, of the series now, and our cast is either growing up or growing old, depending on which generation you’re looking at, their lives weaving together like those of the previous book, with an astounding regularity (which can seen over-contrived until you stop to consider, say, the phenomenon of one of your old Uni friends who lives in Scotland running a seminar with someone you met at a social media event in Birmingham, neither knowing that the other knew you). While Spring was, of necessity given the ages of the central characters, but I think these themes bear discussing, all about how you find friends and form friendships, Summer is about marriage, with various different types of marriage and levels of success examined, even if it is apparently impossible to describe your own. Nick Jenkins, the narrator’s, life events happen off stage or as a setting for encounters between other characters, but somehow you develop a deep fondness for him nevertheless. This review is coloured by the war years reading of Autumn, but it was a very enjoyable read, comforting in its re-reading, and offering so many and varied characters and experienced, criss-crossing through time a bit but really never becoming too confusing. Oh, like the previous read there, too. Currently reading – good old Autumn, and I must pick up my last book by Vita to round off the month. State of the TBR for October coming soon … watch this space on Tuesday! 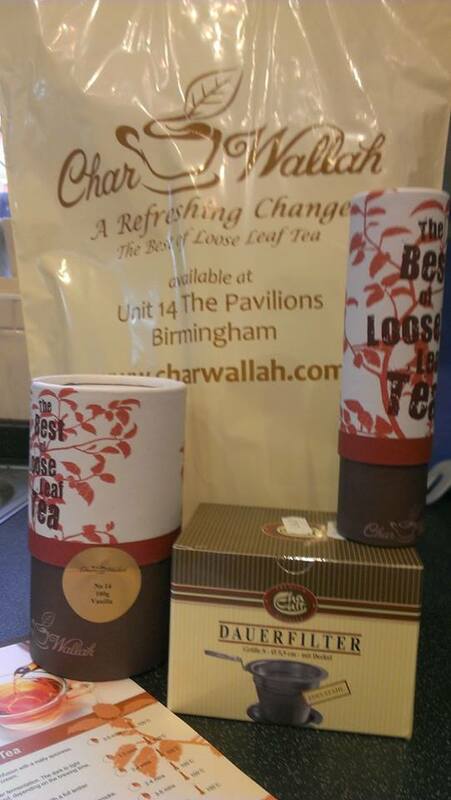 Book reviews – Family History, Journey of a Lifetime and a DNF! Hooray – I’m doing well with my plan to read all of the books I have been sent by publishers or were written by friends, with reviews of Heroines on Horseback and From the Slopes of Olympus to the Banks of the Lea already published, and now here are two of the three books that Bello Books kindly sent me. And, oh look: Vita Sackville-West is their author of the month at the time of writing, and here’s a review of one of her marvellous books. Enjoy! It’s taken me a while to be able to be far enough from this book to write my review. Simply put, it’s the story of Evelyn Jarrold, previously unblemished daughter-in-law of a self-made millionaire, established in the upper middle class, raising her son in the ‘right’ way, sending him off to Eton and discouraging his socialist leanings, never seemingly involved with anyone from her husband’s death in WWI up until the present day in the 1930s, and her sudden, shocking affair with an MP, much younger than her and rising star of the socialist intelligentsia. It’s a riff on the Byron couplet “Man’s love is of man’s life a thing apart / ‘Tis woman’s whole existence”, which, as Victoria Glendenning says in her Introduction, is never clearly said in the book, but is sitting behind its every turn, as Evelyn fights against having to share her Miles with his farm, his book and his political agent … and her son, while Miles fights against enclosure into her world of silks and shopping. it’s doomed, isn’t it: you can tell from that first paragraph. But goodness, it’s portrayed so beautifully. Every detail of both protagonists’ feelings is flayed and laid bare, and we’re given contrasting facets within people’s own complex personalities – the father-in-law in particular being given a rich range of behaviours and reactions. Evelyn’s gradual disintegration of personality and, then, person, is vividly and surgically portrayed. And the ending, which would involve a massive spoiler but made Harold Nicolson cry all the way on the train journey from Staplehurst to Charing Cross, is both shocking and inevitable, especially given the time (if you want to be warned, follow this footnote to the bottom*). I love this book for its amazing portrayals of human nature, but probably most for its examination of the rising kinds of class and people who were taking hold at the time of writing, and most of all for the lovely portrayal of Vita’s castle and grounds at Sissinghurst, the early days of which are lovingly portrayed in this novel. This was a marvellous surprise and something to linger over when I re-read – it was instantly recognisable with a real thrill of recognition. I made a mistake here, and I’ll freely admit it. When Bello Books sent me a pdf of their catalogue and asked me to point out a few books I might choose to read and review, I was intrigued to note this author’s name next to some short stories. I’d read and loved her “Celestine: Voices from a French Village“, which was, of course, a non-fiction book, and I fooled myself into thinking that my love of this would translate into love of her fiction, even though I have history in this (for example loving Paul Theroux’ travel narratives and loathing his novels). So, it was modern short stories, which I have to admit that I’m not usually hugely keen on such things. I didn’t feel that engaged with them, They seemed to be a bit formulaic, in that each must have a twist, a couple I found a little distasteful, and a couple had a rather menacing and supernatural tone to them. One story would potentially be triggering if you’re bothered by reading about child abuse, and I’m putting in a footnote about which one below* if you want to know which one. I am aware that many people like the modern short story and its tropes, and will just say that they weren’t for me, but that’s not to say that they are bad as such. 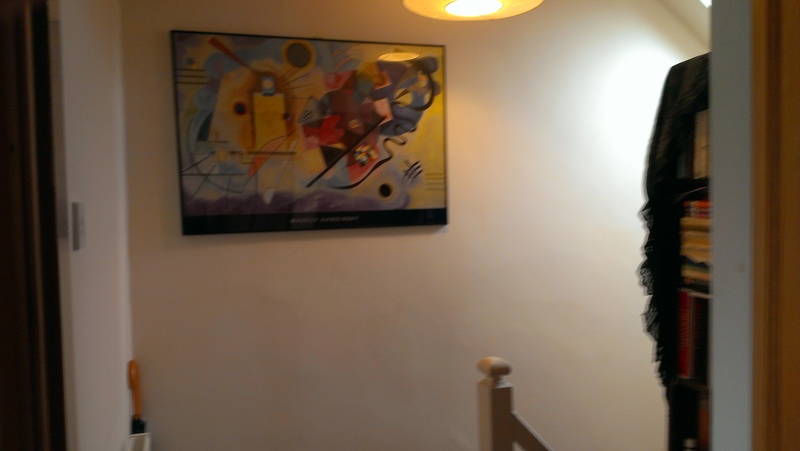 I have shared the book via BookCrossing, so that someone else can read, review and find out about Bello Books. This book was promised as a look at everyday, ordinary life in China over a long period of time. But I found that it was a collection of unconnected pieces, interviews and others, published in newspapers and journals over the author’s lifetime. And although the interviews are with individuals, they do not really give a flavour of ordinary life in my opinion. I love this kind of book, and I’m afraid the disjointed nature of this (and the fact that the first piece had footnote numbers with no footnotes to match (I don’t think this was an ARC, it looked pretty complete to me) left me cold. Oh yes, and there was quite a lot about Bridge, a game I do not follow. I gave up half way through. Currently reading: I’m currently working my way through Anthony Powell’s “A Dance to the Music of Time: Autumn”, so we’re in WWII and Wales at the moment. 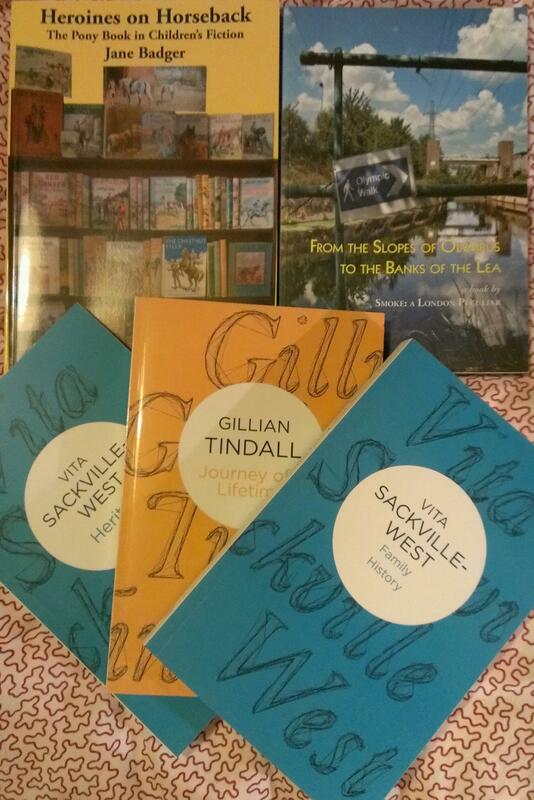 I have a Michael Holroyd on the go, and I’m also going to start Vita Sackville-West’s “Heritage” shortly – what a treat that will be! “Family History” – be wary of reading “Family History” if you’ve recently nursed someone at home, as it may be a little too close to home. “Journey of a Lifetime” – the last story is potentially triggering around child abuse. I discovered a little magazine about London when I still lived there, so, oh, about 10 years ago now, I think. 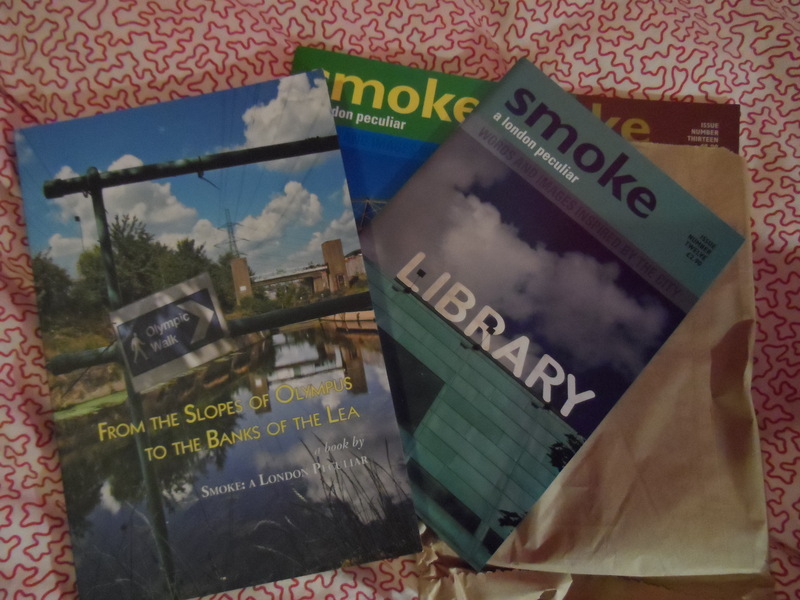 It was called “Smoke: A London Peculiar” and it had all sorts of marvellous photos, stories and essays about life at the edges of London, the things no one notices, the experience of actually living there. I know I bought some copies at Foyles; I am sure I bought one or two at the Books Etc. in Covent Garden, just a stone’s throw away from our flat. I read, absorbed and kept. Fast forward a good few years. I’m busily working away with my first and original rock writer transcription client, Jude Rogers, and we get chatting here and there between the jobs, as you do, and I suddenly realise that she is all to do with Smoke, and they’re still publishing (or were at that time – it’s now a rather good website instead of a print magazine) and what’s more, they’re doing a book. Cue much excitement. 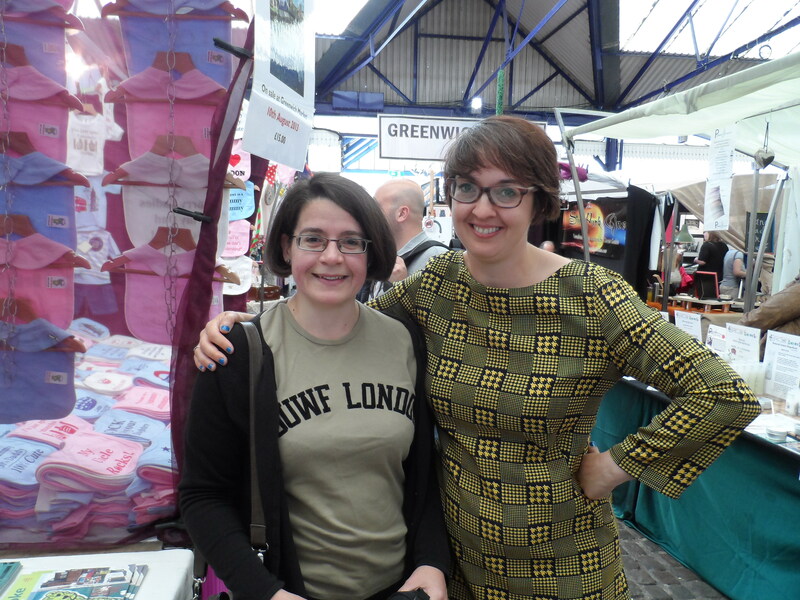 No: cue much excitement AND a sudden impromptu trip to London where I met my friend Em and her daughters and went to the launch stall for The Book at Greenwich Market. So that’s see my bestie – tick – visit an old haunt of my New Cross days – tick – and meet one of my clients (doesn’t happen very often) – tick. Oh, and buy a book. And all the back copies of the mag that I didn’t already have. I don’t buy books that often, do it … Anyway: how exciting! Here’s a rundown of the day. But it was August, and August is All Virago / All August, as regular readers might just have noticed … so it wasn’t until September that I got to read and review this superb book. Sorry! First impression: a lovely object. A good Book, with high production values; with a weight to it. I was holding it while I was banging on to them about e-book versions. 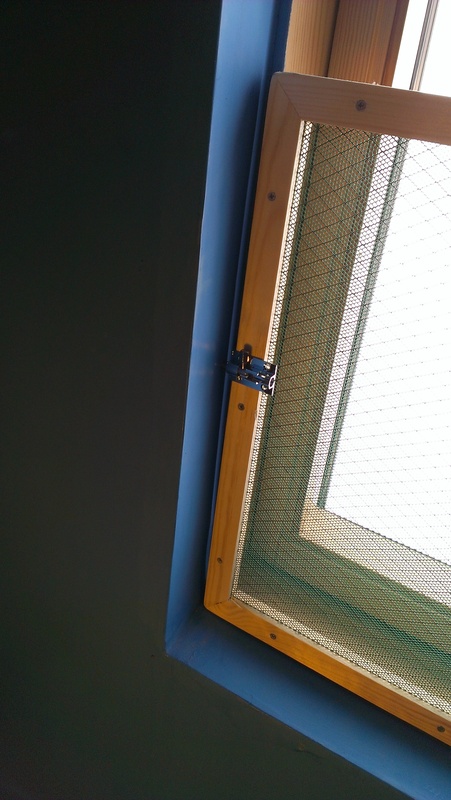 Why oh why etc. The book works its way chronologically from announcement to building works to opening ceremony to Games! to closing ceremony to Paralympics to afterwards. But it very cleverly reflects the attitudes I remember seeing and noticing at the time: negativity and apathy building up to a slightly unwilling, very British liking – almost sneaking love, especially around the opening ceremony. But even in these early days, there are flashes of laugh-out-loud humour, for example when Rishi Dastidar and friend unwittingly trespass on the building site. Then come genuine, sobbing gobbets of tears reading the experience of the person in the opening ceremony and the emails between a UK worker and their US counterpart about cultural misunderstandings. Tears switched to howls of laughter, especially at Matt Hayne’s ‘Ian and Will have a cup of tea’ which gently mocks psychogeography, as you do. There are some wonderful overheard conversations and mediated essays by Jude Rogers, and an experience of viewing the games on screens while at the games, which is fascinating. There are some marvellous photographs that encapsulate the very best in urban photography, and some brilliant cartoons by Alex Farebrother-Naylor. I loved this book. As a big (but not uncritical) and lifelong Olympic Games lover, this sits happily with my DVD retrospectives – indeed I think I will shelve it with them – filling in the liminal London spaces around my Midlands TV viewing / one day in London experience of the event. And, no, I won’t be lending it out. But I will be buying lots of copies and pressing them onto people! Although I bought my own copy and haven’t been asked to post a link, here’s more about the book and how you can get hold of a copy. I’m doing yet another special reading project this month, picking out books by friends and associates and ones that have been kindly sent to me, before they get swallowed up in the TBR shelves. This one was well due a read, as I bought it back at the end of May (to be fair, July was a Month of Re-Reading and August was All Virago/ All August but why didn’t I read it in June, eh?). Pony books are my secret (not guilty) pleasure and anyone who knows me or reads this blog knows that I still read them avidly, mainly the ones I grew up with, but also newer ones such as the excellent book s by Jane Smiley. I was very excited when Jane announced that she was writing a book on the history of pony books, their authors and their illustrators. I can’t quite believe that there hasn’t been one before, but there really hasn’t. This excellent book takes as its basis a chronological approach to the genre, taking us from the early didactic works, often written “by” the pony, through the classic years of the 1950s and right up to the modern day. 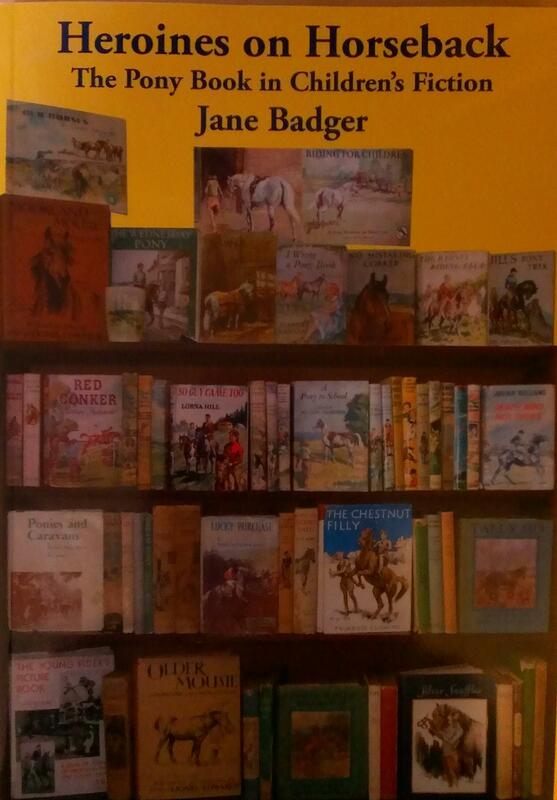 There are also general chapters on annuals, short stories and the illustrators (with good and bad examples of these) as well as the important non-UK / overseas-set wild horse books. As well as treating a couple to several writers per chapter, it sets the books against their socio-cultural background and what was happening in the horsey world at the time. The writing style is very engaging – there’s enough detail to please the biggest fan of the major (and less major) writers of the genre, and it’s rigorous enough to stand its ground in an academic environment. The author puts in her own point of view, but also shares those of others, including any surviving authors or their representatives, people from discussion forums and her own blog, and people from the world of the (pony) book who have contributed short essays on their own favourites. It was genuinely very pleasing – even thrilling – to find my old favourites in here, discussed in detail and set within the context of their authors’ oeuvres. There were a few surprises and a lot to learn, and this will be a valuable resource that will be picked off the shelf every time I read or re-read a pony book from now on. It’s lovely to read something that’s familiar, heart-warming, intellectually stimulating and a pleasure as an object, with high design and production values. I was pleased to find that it was superbly edited – not a typo could I find, not a misplaced comma. Not that I was looking for them, but, you know. The text is what one would call lavishly illustrated, and there is a good index and bibliography, too. I would recommend this book to any man or woman who read pony books as a child and / or reads them now, or who is interested in children’s books or the artefacts of 20th century publishing. It’s a book which I am very happy to own, and will consult regularly. I’ve only acquired three books in September, I think – not TOO bad? I even went into the shop next door to The Works on Saturday and managed not to get caught in the book-buying vortex. 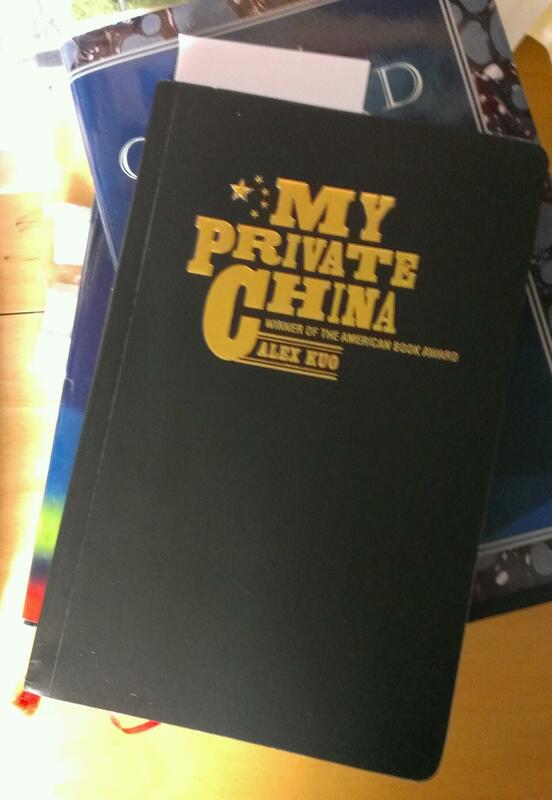 First up, Alex Kuo’s “My Private China”, which came courtesy of the LibraryThing Early Reviewer programme. It’s meant to be an insider’s guide to life in modern China, but as it’s a collection of essays and interviews that have already been published elsewhere, it’s a bit disjointed and I’m not loving it so far (you are supposed to review these within a month of receiving them, hence the promotion up the TBR). 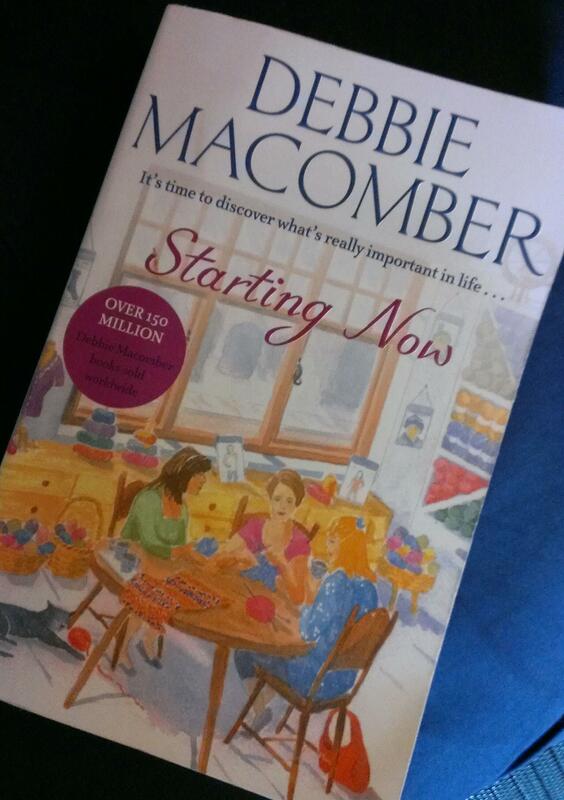 And this one arrived today, courtesy of Gill again, but originating from our friend Sorcha – a new Debbie Macomber in her knitting shop series, “Starting Now”. Both Gill and Sorcha seem to have been a little underwhelmed by this, so it’s going on the TBR where it should go, at the end, but if I’m in need of an easy read, I will pull it off the shelf. Currently reading: I’ve just finished another couple of my sent to me / by my associates books so watch out for some new reviews soon! Whoops. I finished the second of these two in the early morning – before breakfast – on 1 September, so really it still counts as an August read and an All Virago / All August read, doesn’t it? Doesn’t it? To my shame, I have already published my roundup of AV/AA, but this scheduling malarky does get a bit complicated, what with having to do a State of the TBR post around the first of each month, and not liking to post on here on a day when I’ve posted on my business blog. All self-created malarky, of course. ANYway. Here we have two books about faithfulness. But possibly not in the way that first strikes one. In fact Susan Glaspell’s “Fidelity” is very much NOT about marital fidelity, in fact quite the opposite, with actual and perceived infidelities causing havoc in a very conservative town, its families and marriages. And “The Rector’s Daughter” doesn’t feature many quite successful marriages; however the title character is loyal and steadfast to her own morals and her own love. Well, what was I THINKING? There’s a Persephone set in small-town early 20th century America about families, friendship, marriage and growing up, and it’s Persephone No. 4 which means it’s been around since their first year, and I hadn’t bought or otherwise acquired it yet? It even influenced Sinclair Lewis’ “Main Street”, which is another big favourite of mine. I have no idea how I managed not to buy it until them, as, of course, it’s a classic “Liz” read and will be a much-loved re-reader from now on. Ruth has committed the terrible sin of falling in love with an unhappily married man in a town and a time when that is basically impossible. Shunned since she left town with said man, she returns to visit her ailing father and finds that she has a few allies, including the boy who loved her first, now one of the town’s doctors and newly married himself, and has stood up for her since she left, and other outsiders from her schooldays, as well as one of her brothers. Broken by her best friend’s refusal to acknowledge her, she takes comfort in the small braveries of others, but there’s a hard price to pay for young Mildred, who openly supports her while in much the same position, and gets the sharp end of what Ruth has learned from her own experiences, and the doctor, whose wife is trying to slot into a new society at the same time as he is going against it. Is the first flush of love enough? asks the book. The fidelity of the title is, of course, double-edged – while referring to the cultural norm, it also strongly underlines the need to be faithful to yourself and your own development and soul. While you do want the obvious outcome of the book to come about, you do however cheer when that’s not quite what happens. A brilliant book, a masterpiece of small-town observation and an absorbing and attractive read. The deceptively simple tale of an unmarried woman looking after her academic, religious father in a small village, this 1924 novel is actually quite shocking in terms of what it will put its characters through – there was more than one gasp out loud moment, even though it’s set in another traditional community with 19th century attitudes in the home of a stern rector with fixed ideas of the role of women and daughters, and his own daughter, trapped by expectation and stifled by the tradition that has raised her. A tragic tale of the ‘extra’ woman in many ways, but she does have her moments, and her great love. Satirical portraits of Bright Young Things with their very different morals and a rather louche somewhat married crowd in the South of France are contrasted with Mary Jocelyn’s quiet life with few friends, blossoming in love and in later life, with a rich interior life. 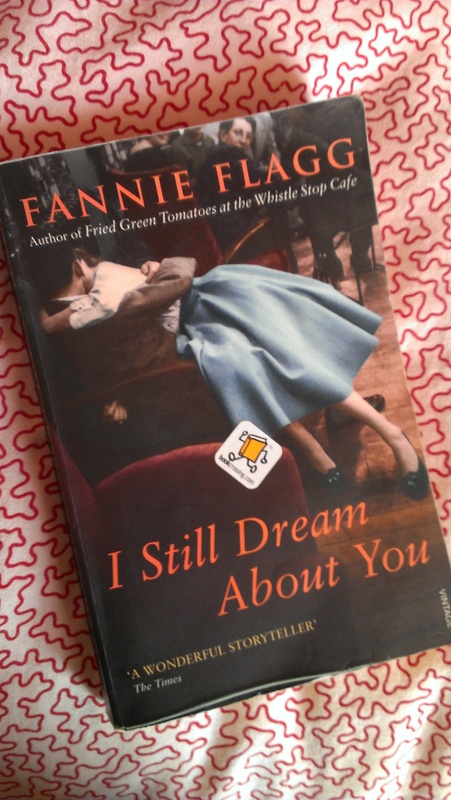 Although there is a shocking moment in the plot (surprising and unusual rather than gratuitous or unpleasant), it’s a quiet novel which again discusses whether – and how – first love can last the course, marriage and fidelity. There are some excellent portraits and, like “Fidelity”, it’s partly a study on the effect on a marriage of external influences. I’ve now also completed “Heroines on Horseback”, next up for review, and galloping through “A Dance to the Music of Time” with Matthew and Linda. I’m hoping to get to a few more books as soon as I’ve recovered my workflow from last week’s workmen (see my upcoming post for more on that little workmare!). What are you reading through the autumn?